Thousands of chat calls are handled each and every day around the world. The way these chats are handled can make a huge difference to a company’s relationship with its customers – and bottom line. Using proper language in Live Chat is essential to customer satisfaction. Chat conversation lacks wealth of body language and eye contact that you get face to face, so the tone and mood can get lost. In addition, words may mean something different to the customer than they mean to you, and a simple chat conversation can result in a disastrous misunderstanding and even unknowingly drive customers away. All the other person has to go from is your words. So why not choose them a little more wisely? We used our own experience to discard phrases that put customer experience in jeopardy. 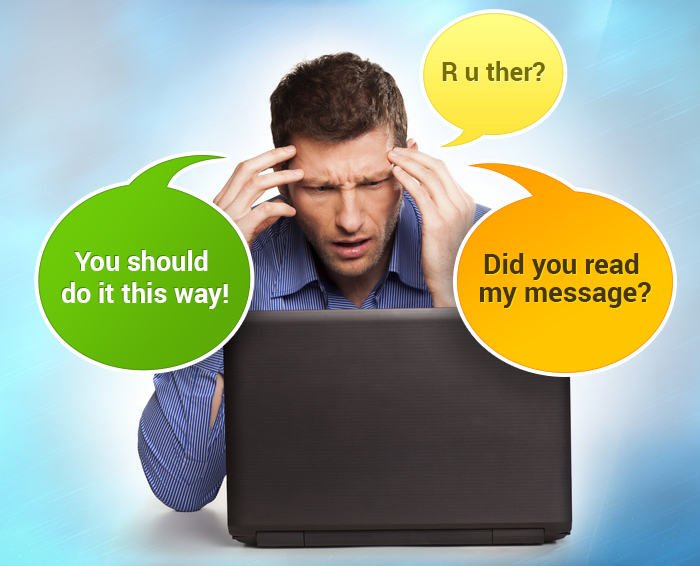 Here are the top 10 commonly used phrases we recommend to avoid in Live Chat. We also include loose translations of the phrases, and better alternative language to use. The rude translation is, “We won’t do this for you,” or “I don’t want to help you.” Rather than making any statement, the better way to go is to thank the customer for the great idea how you can make your service better, or apologize for something not available with your company yet. “Thank you for your feedback, that’s a great idea” or “Unfortunately, such a feature is not available with us so far” would sound far better. Most people don’t like being told what to do. Sounds like “I’m smart and you’re not that good and don’t know what you should do …. ” We suppose that an alternative like “I suggest it’s worth trying these steps…” works better. If you could also include a few words about why you think these steps would help in this particular situation, it would establish a good rapport, too. Or in other words, “I have already told you… why don’t you read my previous message once again before asking this stupid question! ” You would never say or mean such a thing, of course. If the answer is not clear to them, it’s your fault, so please rephrase your previous message or divide it into smaller pieces. Like most clichés, this phrase coined a few decades ago, tends to annoy people rather than add a polite touch to your message. When overused they may even create an impression of laziness or a lack of careful thought. The quick fix here would be to completely avoid using such phrases in Live Chat. After all, are you thinking in clichés? Another cliché. Do you think it makes you sound professional? Not even close! Instead, it gives a solemn, almost hat-in-hand touch to your writing making it sound overly formal, impersonal and even insincere. ‘Please’ would work far better here. If you want to achieve a professional and up-to-date communication style, you should avoid using such words and expressions. Use short words and simple expressions instead of long-winded old-fashioned jargon. This phrase may seem innocent but it has a rather schoolmarmish tone, really: “Now, pay attention! ” We would suggest that you make it sound a little less strict by asking “Did you know that… ?” or “Let me make sure you get it right”. Again, here’s a phrase that may sound innocent to you. This widely used expression is appropriate almost everywhere as a polite response to ‘Thank you’. Actually, there’s nothing wrong about this expression. However, in customer service you’d better respond with ‘Thank you’ or ‘My pleasure’. Believe it or not, it gives a deeper level of thought to the meaning behind your words. Not only ‘I was glad to help you’, but ‘Thank you for choosing us’ at the same time as well. In Live Chat visitors usually have an option to select a department they would like to reach. This option lets them quickly get directed to the right person and get their request handled quickly and efficiently. Things happen anyway. Sometimes visitors just forget to select a department, or they are not sure which one is the best to address their inquiry. ‘You’ve reached a wrong department’ would take you hitting 25 keys on your PC keyboard. And it still has a rude ‘It’s none of my business’ implication in it. Instead, inviting a right person into the chat room would take you just a few clicks! That’s what we call online customer service at its best! Have you ever been in the position that you had had to listen for a few minutes to the description of what customer is interested in before you finally got it? Drop it! Stay up-to-date with the latest technology trends in customer service and make the most out of the Live Chat Operator Console! Take a look at visitors’ details to find out where they are and what kind of assistance they are looking for even before they ask their questions. With the Real-Time Visitor Monitoring feature you can in no time find out which keywords they used to get to your website and which pages they have browsed before contacting you. We hope reading this list was helpful. While in-person meetings have the advantage of offsetting any misunderstanding through facial expressions and body language, online channels give you the option to re-read and think it over for another second before clicking the Send button. Don’t forget to put yourself in the place of the recipient and ask ‘Does it make sense? Does it say what I want? Does it get the message accross?’ And we hope as a result, your efforts will help get things done more smoothly, and make communication with your customers more effective. This entry was posted in Articles, Tips and Tricks and tagged live chat etiquette, live chat in customer service, phrases you should not use. Bookmark the permalink.